For the specific wired model currently sold as the "Apple Mouse", see Apple Mighty Mouse. Mice manufactured by Apple typically emphasize use of a single button control interface. It was not until 2005 that Apple introduced a mouse featuring a scroll ball and four programmable "buttons." All mice made by Apple contained a ball-tracking control mechanism until 2000, when Apple introduced optical LED-based control mechanisms. Apple's latest mouse uses laser tracking. In 1979, Apple was planning a business computer and arranged a visit with Xerox Parc research center to view some of their experimental technology. It was there they discovered the mouse, invented by Douglas Engelbart while he was working at SRI International (SRI); the mouse had subsequently been incorporated into the graphical user interface (GUI) used on the Xerox Alto. During an interview, Engelbart said "SRI patented the mouse, but they really had no idea of its value. Some years later it was learned that they had licensed it to Apple for something like $40,000." Apple was so inspired by the mouse they scrapped their current plans and redesigned everything around the mouse and GUI. One of the biggest problems was that the three button Xerox mouse cost over US$400 to build, which was not practical for a consumer-based personal computer. Apple commissioned Hovey-Kelley Design (which later became IDEO) to assist them with the mouse design, which not only had to be redesigned to cost US$25 instead of US$400, but also needed to be tested with real consumers outside a laboratory setting to learn how people were willing to use it. Hundreds of prototypes later, Apple settled on a single button mouse, roughly the size of a deck of cards. With the design complete, the operating system was adapted to interface with the single button design using keystrokes in combination with button clicks to recreate some of the features desired from the original Xerox three-button design. With the single button mouse design established for almost 25 years, the history of the Apple Mouse is basically a museum of design and ergonomics. 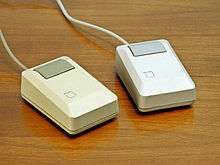 The original mouse was essentially a rectangular block of varying beige and gray color and profile for about a decade. Not much later, it was redesigned to be slightly angular along the top; this mouse is commonly called the "trapezoid mouse" for its slight trapezoid shape on the bottom. In 1993 Apple redesigned the package to be egg-shaped, which was widely copied throughout the industry. Nevertheless, it was still a tool available only in corporate gray or (rarely) black. With the release of the iMac in 1998 the mouse became available in an array of translucent colors. Apple also completed the transition to a completely circular design. Two years later, Apple switched back to a more elliptical shape and monochromatic black and white design. The rubber ball tracking mechanism was updated with a solid-state optical system, and its single button was moved out of sight to the bottom of the mouse. Keeping up with the technological trends Apple went wireless in 2003 and two years later, though maintaining its iconic design style, broke its most controversial implementation in the mouse concept and for the first time released a “none button” mouse with five programmable electrostatic sensors and an integrated scroll ball. Though the Macintosh aftermarket had provided these options to discerning users for decades, Apple itself only made them complementary with its offerings after the passage of much time. All of Apple's Bluetooth mice have cross-compatibility with almost every Bluetooth capable computer, though they are not supported by Apple for use on PCs. Apple's USB mice likewise are compatible with nearly all USB equipped machines. Prior to USB, Apple created the Apple Desktop Bus (ADB) interface. Though some other manufacturers (NeXT, etc.) licensed Apple's technology and ADB mice were completely interchangeable between them, the mouse interface IBM introduced on the PS/2 quickly came to dominate the market and crushed all competition. ADB-to-PS/2 adapters were always extraordinarily rare, while the early years of Apple's transition to USB brought with it a raft of popular USB-to-ADB adapters. Apple's first mice used a DE-9 connection carrying quadrature signals. As the personal computer was still in its infancy with no standards, Apple's mice could be used on any system capable of using such a quadrature mouse, in combination with a spliced cable or adapter as necessary. The mouse created for the Apple Lisa was among the first commercial mice sold in the marketplace. Included with the Lisa system in 1983, it was based on the mouse used in the 1970s on the Alto computer at Xerox PARC. Unique to this mouse was the use of a steel ball, instead of the usual rubber found in subsequent and modern mice. 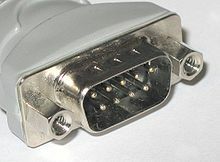 It connected to the computer by means of a standard DE-9 and unique squeeze-release connector. Though developed by Apple, it was actually designed by an outside firm, Hovey-Kelley (renamed IDEO in 1991), who built hundreds of prototypes and conducted exhaustive testing with focus groups in order to create the perfect device. Their perseverance paid off as not only did they bring the design in on time and on budget, but the resulting device remained virtually unchanged for almost 20 years. It was this mouse that established Apple's mouse as a one-button device for over 20 years. Every single aspect of the mouse was researched and developed, from how many buttons to include, to how loud the click should be. The original case design was Bill Dresselhaus's and took on an almost Art Deco flavor with its formal curving lines to coordinate with the Lisa. The Macintosh mouse was little changed from the original Lisa version and is completely interchangeable. The case was a slightly darker brown than Lisa's beige coloring and it had less formal lines, with a thick chamfer around its edges to match the Macintosh case. Mechanically, the Lisa's steel ball was replaced by a rubber covered steel ball, but otherwise connected with the same DE-9 connectors, though updated with a square-shape and standard thumb screws. When the Macintosh Plus debuted in 1986, Apple had made minor revisions to the mouse mechanism and across all product lines, unified the cable connectors and used a more rounded shape. The following year, Apple once again unified its product lines by adopting a uniform "Platinum" gray color for all products. In 1987 this mouse had its final design change, updating both its color to Platinum with contrasting dark gray "Smoke" accents and minor mechanism changes. Four months after the Macintosh debut, the Apple IIc was introduced with the addition of an optional mouse to manipulate standard 80 column text. The mouse was similar to the Macintosh mouse, though it was in a creamy-beige color that co-ordinated with the IIc's bright off-white case and had a slightly modified design which was sleeker than the Macintosh's blockier shape. It also was uniformly the same color, eliminating the Mac & Lisa's contrasting taupe accents on the mouse button and cable. Unlike the Macintosh, the IIc Mouse shared a dual purpose port with gaming devices like joysticks. In order for the IIc to know what was plugged into it, its mouse had to send the appropriate signal. Despite these differences, it carried exactly the same model number as the Macintosh version. An Apple Mouse packaged for the IIc, it coincided with a minor change in the mouse mechanism and connector style. In 1988 it took on the identical physical appearance and coloring as the Platinum gray Macintosh Mouse. Unlike its predecessors, the USA manufactured versions of the Platinum Macintosh/Apple IIe mouse will work on the IIc too. All versions of the IIc Mouse will work with any Macintosh or Apple II card. As a result, Apple briefly sold the intermediate model as the Apple Mouse optionally for use across all platforms. By mid-1984, Apple’s commitment to bringing the mouse to its entire product line resulted in the release of the Apple II Mouse Interface peripheral card. Since this was a dedicated mouse port, Apple simply re-packaged the Macintosh mouse, but with the same creamy-beige cable and connector used on the IIc mouse and bundled it along with special software called MousePaint for use with the Apple II, II Plus, and IIe computers. Like the original IIc mouse, it used the same model number as the Macintosh Mouse. Unlike the Mouse IIc, however, it can be interchanged with the Macintosh version, but cannot be used on the IIc. Due to the popularity of the Macintosh and shortage of mice, Apple later repackaged the original Apple Mouse IIc in this bundle as well since it was cross-platform compatible. The AppleMouse II and its successors were never included as standard equipment on any computer. Since the original Apple Mouse IIc was compatible across all platforms, Apple renamed the mouse in 1985 and offered it as an optional purchase for all computers and separate from the Apple II interface card. It featured an updated mechanism and the new uniform rounded cable connector. Apple would briefly reuse this name later for a re-badged Apple Pro Mouse. By 1986, Apple had updated its product lines with new cable connectors. With the Apple IIe already three years old, the AppleMouse II was re-badged for the IIe alone and essentially used a repackaged Macintosh Mouse with no modifications. Later it would also use the Platinum Macintosh version. The US-manufactured version of the Platinum mouse is also interchangeable with the identical-looking IIc mouse. In September 1986, Apple continued a year of major change by converting its mice and keyboards to the Apple Desktop Bus (ADB). Newly redesigned, this mouse retained the blocky footprint of its predecessor, but had a lower, triangular profile. 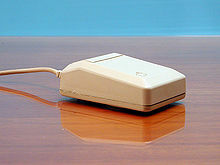 The first official Snow White design language mouse (the Apple Mouse IIc was technically the first), it was a uniform Platinum gray color, including the single button, with only the cables and connectors retaining the contrasting darker gray "Smoke" color. 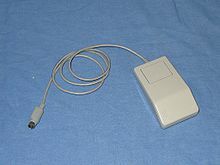 It was introduced on the Apple IIGS computer and later became the standard mouse included with all Macintosh desktop computers for the next six years. In only its third major redesign in ten years, the Apple mouse shed its blocky exterior for rounded curves. The so-called tear-drop mouse, was essentially the same as its predecessor but with a new case subsequently held as the ideal shape of mice. Indeed, the basic design has persevered into current models, as well as being widely adopted by other mouse manufacturers. It was included with all Macintosh desktop computers from 1993 until 1998. It was also the first mouse produced by Apple in black to match the Macintosh TV as well as the Performa 5420 sold in black. The Apple USB Mouse was Apple's first USB mouse. Released with the iMac in 1998 and included with all successive desktop Macs for the next two years, the round "Hockey puck" USB mouse is widely considered one of Apple's worst mistakes. Marking the switch from ADB, the colorful translucent mouse was a radical departure from its predecessors, down to a ball whose two-tone surface fluttered past the user's eyes as it spun under the mouse's translucent housing. However stylish, the mouse's round shape is widely considered clumsy, due to its small size and tendency to rotate in use. This was a major cause for the success of the Griffin iMate ADB to USB adapters, as they allowed for the use of the older, more comfortable ADB Mouse II to be used with those iMacs. Later revisions included a shallow indentation on the front of the single mouse button, but this was not enough to prevent a flood of third-party products like the iCatch and UniTrap, shells that attached to the USB mouse to give it the ADB mouse's elliptical shape. Another flaw introduced in the Apple USB Mouse, shared across all of Apple's USB offerings, is the atypically short cord. Though intended for use through the integrated hub in Apple's keyboards (which have themselves had shorter integral cables since the USB transition, eventually prompting Apple to bundle keyboard-only extension cables with tower Macs), Apple's transition to USB coincided with the relocation of ports on their laptops from the center to the left edge. As none of Apple's USB mice have cords longer than two feet, they are impractical for most right-handed users. In a move away from the bold colors of the iMac and in a return to the styling of the traditional mouse design, in 2000 Apple discontinued the USB mouse and introduced the all-black Pro Mouse. A similar design to the ADB II mouse, the black Apple Pro Mouse was surrounded by a clear plastic shell. After taking years of criticism for their continuation of the one-button mouse, Apple effectively flipped the design of a "normal" mouse upside-down, with the sleekly featureless appearance that resulted inspiring its jocular appellation as "the first zero-button mouse." This was the first Apple mouse to use an LED for fully solid-state optical tracking instead of a rubber ball. It was included as the standard mouse with all shipping desktop Macs and was later made available in white. However, in May 2003 it underwent a minor redesign, during which time the black version was discontinued, and Pro was dropped from its name. Like many earlier products (see SuperDrive) Apple re-used the name Apple Mouse briefly after the Pro Mouse was discontinued. As for the recent Apple Keyboard models, Apple did continue to use the Apple Mouse name for its subsequent model releases: the Apple Mighty Mouse of 2005 has been renamed Apple Mouse circa 2012. An optional Bluetooth-based cordless version of the Apple Mouse in white, released in 2003 was Apple's first cordless mouse. Combined with internal Bluetooth interfaces in new Macs, this bypassed their wired relatives' aberrantly short cords to once again make Apple's mouses usable for left-handed laptop owners. Previously included with all new Macintosh desktop models, it was a major departure from Apple's one-button philosophy integrated in its design since the Lisa.. This mouse was called the Mighty Mouse but was renamed to just 'Apple Mouse' in 2009 due to legal issues with the name. Under increasing pressure to sell a generic two-button mouse with a scroll wheel, Apple decided to develop a mouse (in 2005) with touchpad-like capacitive controls instead of buttons, and featured a tiny integrated trackball in place of a scrollwheel. A year later, an optional wireless version was released with the same name as its wired counterpart. Introduced on October 20, 2009 as a replacement to the Wireless Mighty Mouse. The Magic Mouse features multi-touch gesture controls similar to those found on the iPhone and the MacBook's trackpads, wireless Bluetooth capabilities and laser-tracking. The Magic Mouse is included with the new iMac, and the Mighty Mouse is no longer available as an option. On October 13, 2015, Apple released a second generation Magic Mouse that charges via a Lightning Connector. The port for the Lightning Connector, however, is located on the bottom of the mouse, which means that it is unable to be used while it is charging, a design choice that caused it to be poorly received by most outlets. These paddles were the original Apple-branded game controllers. Essentially a gaming device around long before the mouse, the joystick could be used for many of the same functions. The Apple Graphics Tablet was a large flat surface covered with a grid and had an attached stylus. Released for the Apple II Plus and later a modified version for the Apple IIe. An optional keyboard accessory was provided for the Pippin, which had a large graphics tablet and stylus on the top half of its notebook-like hinged body. The Macintosh Portable was the first Apple machine to use a trackball, essentially a large palm-sized, upside-down ball mouse. The trackball was removable and could be placed on either side of the keyboard, or removed and a number pad installed in its place. The PowerBook line scaled down the trackball to be thumb-sized and included one in every portable from 1991 to 1995 when it was phased out in favor of the trackpad. The Pippin, developed by Apple, had a gamepad with a built-in trackball. Versions were made which connected via the Pippin's AppleJack childproof ADB connector, infrared, and normal ADB. The built-in "mouse" on all Apple portables since 1995. The trackpad has been modified to match the color of the case, traditionally black, it turned white with the iBook and MacBook and aluminum with the PowerBook G4 and MacBook Pro. The MacBook Air introduced a multi-touch trackpad with gesture support, which has since spread to the rest of Apple's portable products. Like Apple's single-button mice, all of their trackpads have no more than one button (though some early PowerBooks had a second physical button, it was electrically the same as the primary button) also like Apple's new mice, their latest trackpads—beginning with the unibody MacBooks and MacBook Pros—eliminated physical buttons. The only desktop Macintosh not to require a mouse. The 20th Anniversary Macintosh instead has a trackpad which can lock into the palm rest of its keyboard. Starting with the iPod 2G, the mechanical scroll wheel was replaced with a wheel-shaped trackpad. Starting from the iPod 3G, this extended to the replacement of all buttons. Apple's Magic Trackpad. Apple's trackpads play a major role in Mac OS X Lion. In late July 2010, Apple released its first wireless, external trackpad. 80% larger than the MacBook trackpads of the time, it matches the end-on profile of the Apple Wireless keyboard and provides an alternative to the Magic Mouse that ships with Apple's desktop computers (with the exception of the Mac Mini). On October 13, 2015, Apple released a second-generation Trackpad with Force Touch technology and charging via a Lightning Connector. In 1993 the Apple Newton used a precision touchscreen which required a rigid and moderately sharp object for input, such as a fingernail or its included stylus. The Newton's touchscreen interaction was equivalent to a simple graphics tablet, and was used to affect what eventually became the most widely lauded handwriting recognition system on the market. This technology eventually found its way onto the Macintosh in the form of 10.2's Inkwell feature, sparking rumors of a Newton revival. The iPad, iPhone and iPod touch incorporate multi-touch touch screens for iOS's gesture-based interfaces. ^ "Apple's Mouse: A History – 512 Pixels". 512pixels.net. Retrieved December 11, 2017. ^ "The Xerox PARC Visit". web.stanford.edu. Retrieved December 11, 2017. ^ "The Making of the Mouse". American Heritage. Archived from the original on September 29, 2007. Retrieved March 15, 2010. ^ "Mighty Mouse". Stanford Magazine. Stanford Alumni Association. March – April 2002. ^ a b "The Evolution of the Apple Mouse". vectronicsappleworld. Archived from the original on July 28, 2011. Retrieved April 18, 2011. ^ "Folklore.org: Macintosh Stories: Apple II Mouse Card". Archived from the original on January 13, 2009. Retrieved January 25, 2008. ^ Gardiner, Bryan (January 24, 2008). "Learning From Failure: Apple's Most Notorious Flops". Wired News. Retrieved January 23, 2008. ^ Chen, Brian X. "Beating Apple, Start-Up Wins 'Mighty Mouse' Trademark". Wired. Condé Nast. Retrieved April 7, 2018. ^ "Apple Magic Mouse 2". PCMAG. Retrieved December 13, 2015. ^ "Review: Apple's Magic Trackpad 2 and Magic Mouse 2 open new doors for Mac". AppleInsider. Retrieved December 13, 2015. ^ "Apple Magic Mouse 2 review: Mouse unable to conjure up any innovation". Macworld. Retrieved December 13, 2015. ^ "The Sad Reality of the Magic Mouse 2". Gizmodo. Retrieved December 13, 2015.